The Spa is a state-of-the-art training facility located at Loyalist College and operated by the Esthetics & Spa Management Ontario College diploma program, which is currently accepting applications for January 2019. We operate in collaboration with our regional esthetics and spa management industry partners. The Spa supports contemporary training in skin, nail and body care therapies available in Ontario and acts as a meeting point for the industry’s premier guest educators from across North America. Leading spa and salon owners, aroma therapists, and high fashion nail and make-up artists regularly share their knowledge and experience with both current students and alumni to help them stay ahead of industry trends. Clients of The Spa receive reduced pricing for treatments, allowing students to practice their treatments and apply their customer service skills in a professional setting using high-end product lines. Education is always the focus of a spa appointment at Loyalist, and clients can expect to receive an in-depth consultation regarding at-home skin, body and nail care regimes when they visit. As the Spa is a learning institute, specialized treatments are offered as they fit the curriculum throughout the academic year. Faculty appreciate the support and understanding that clients show when booking and receiving treatments, as there may be times when students are still at the early stages of learning. The Spa boasts a high-end retail boutique for clients’ prescriptive skin, nail and body care needs. Reusable gift cards are available and have no expiry dates. All retail products and gift cards are gift wrapped to support our students’ merchandising skills. Cash, debit, Mastercard and Visa are accepted methods of payments. Spa opening hours vary depending on the academic semester so please check the hours of operation. Extended hours are offered from May to August. The College supports clients’ patronage to The Spa by offering a reduced parking rate of $2. Due to privacy laws, students are instructed not to leave messages when returning phone calls unless prior consent is given by the client. High school students are welcome to attend with a parent to receive a complimentary skin consultation for minor conditions like teen acne. Loyalist students will educate teens on skin care and which products would help their condition the most. You will be required to fill out a health record prior to treatments. Please bring flip flops for pedicure appointments. Please do not shave 24 hours prior to a body treatment or pedicure service. The Spa at Loyalist, open Fridays (9 am – 5 pm) and Saturdays (10 am – 4 pm), is designed to support program students to streamline a variety of both professional spa management and spa treatments. 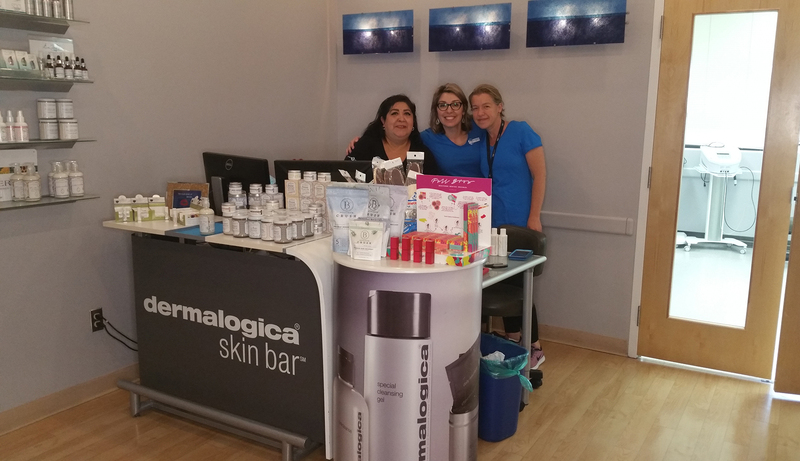 Pictured L – R: Esthetics & Spa Management student Isabelle, Professor Michelle Embury and Program Coordinator Bridget Ferguson.